No matter how you spell it, it comes out as DELICIOUS! This poor post has been in here for THREE MONTHS! Waiting for a story from Frank or John that’s never going to come ;-( We’ll have to rely on my feeble memory and story telling skillz. Thanksgiving vacation, 2008, we went to go visit Frank & Niki in Antwerp with some good friends Steph & Shawn (their first European vaca). One evening while wondering homeafter drinking a LOT of great Belgian beer, I wanted Frietjes. Frietjes are freshly made at a French fry stand with a big GLOP of mayonnaise! The stand we frequented is kitty corner to a Shawarma restaurant. Shoarma Restaurants, Plate of Shwarma, Shawarma meat cone. Steph & Niki wanted a couple fries too, but since I wasn’t sharing they had to get their own! The boys wanted something more substantial and made a bee line to the Shoarma Shack. We girls stood outside and downed our fries (so glad I didn’t share) as the boys gobbled up their pitas. Can you say “oink, oink”? Then, in the following day or two, as we’re strolling around town trying to find a place to eat lunch, Frank is making us trek up and down EVERY street as we got hungrier and hungrier, passing more and more restaurants. You see, with Frank there’s always something better just around the corner (right, right). Finally the other five of us were tired of traipsing around and DEMANDED we walk into the NEXT restaurant we pass. Low and behold it’s Shawarma! Frank didn’t think we should, as we had already had some this trip. We were all so HAPPY we did , because this was a STELLAR FEAST! I used chicken tenders and it tasted so awesome. The KEY is the Fenugreek spice, so be sure to make that extra trip to a spice house to get it, just as I did, you won’t regret it! In mixing bowl whisk to combine – add a little water if the sauce is too thick for your liking. Let marinate for 2-24 hours. Grill chicken until tender DO NOT OVER COOK! 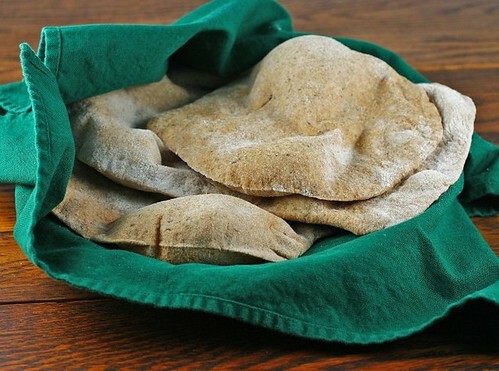 Serve on pita – we made our own – it’s easy and a lot of FUN! WOW!!! Glad you got this one posted. It sounds enticing to say the least. I can’t wait to try it! Shawarma (Arabic: شاورما‎), is a Middle Eastern sandwich-like wrap of shaved lamb, goat, chicken, turkey, beef, or a mixture thereof. The meat is placed on a spit, and may be grilled for as long as a day. Chunks of fat within the meat ensure that the shawarma stays juicy. Shawarma is a fast-food staple across the Middle East, Indo-Europe, such as Armenia and North Africa. Thank you, Mary….er, I mean Wiki. The picture of the meat roasting reminds of the Mexican “al pastor” which is one our favorite fillings for tacos……but those spices sure aren’t Mexican! I’ve never heard of fenugreek–I have to google it! This sounds so yummy. One of my best friends’ favorite foods is shwarma but I’ve never had it. Now I HAVE TO HAVE IT. Thank you for sharing your wonderful recipe. Yes, Mo. All the spices in this recipe are ground. The spice mix sounds great! Lamb Shwarma here I come! Yum! I love Shwarma! I love Belgium too. You brought back memories! You’re funny. This was worth the three months! This was well worth the wait! What a fantastic way to give a burst of flavor to any meat. 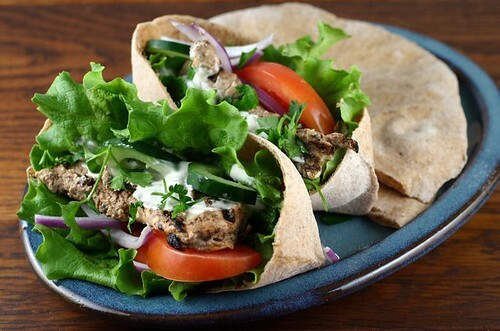 That is some tasty sounding chicken and the pitas look so fresh and good! Love that spice receptive! Looks good. I’ve had shwarma at local restaurants and in London, but I never knew exactly what all the spices were — just knew there were lots of spices in there. Thanks for a great recipe! Ohh, sounds tasty. I would not say no to have your pita for lunch today. This is my favorite sandwich!! ur shawarma looks wonderful, and the pita bread awesome!!! Thanks for this – I LOVE shawarma. Grew up on it living in the Arabian Gulf. There it was served in pita wraps, quite small, so you could easily eat 2 (0r 3?!). Nice, because then you can have one chicken, one lamb – for the indecisive ones among us! I’ve never tired making it properly – may do so now! 🙂 PS: For me, two of the key ingredients were slices of pickled beets (bright pink) and shaved onions mixed with sumac and parsley. Having lived in Israel for a number of years I experienced many wonderful versions of shwarma (a favorite of mine second only to felafel! ), but it was always made with lamb– never chicken. Nevertheless, the recipe sounds marvelous and I’m more than willing to give it a try. Somehow, though, I suspect it would be even better using lamb… maybe I’ll make it twice and do a comparison! Yes, I’m sure, like the wikipedia quote in the post says, that it is commonly made with beef, lamb or chicken. Unfortunately, having grown up on a farm where we raised sheep, I have never been able to develop a fondness for lamb the way most people have. I’ve tried and tried to no avail. So, by all means, use the meat you prefer! I can’t tell you how long I have been looking for Shawarma recipe. Finally. Thank you for the recipe. 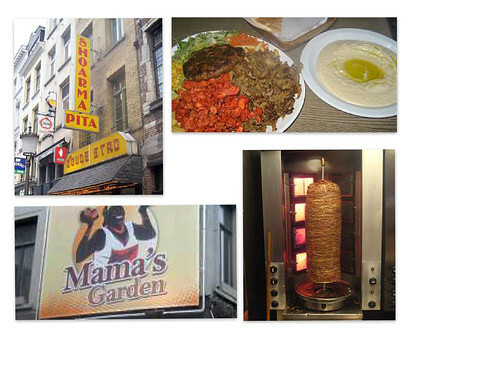 I went to a great restaurant here in Pittsburgh that had an amazing shawarma…or was it Shoarma…oh, I know…shwarma. It was like I was eating in the cooks home kitchen. Opps. that comment about shawarma, shoarma, shwarma was really Culinary Cory. It’s still looks yummy, no matter who might have written the comment. This is a most beautiful and aromatic dish – I love this! Thank you so much for sharing this special recipe. Tabbouleh. Thanks again for this! I just saw shawarma on another post, went to Tastespotting to find a recipe and lo and behold its you! I must have missed this post! Made these for dinner last night…yum! Even my picky eater ate them..
well but they ended up cooking up fine. Thanks Mary!!! Woo Hoo! Now you’ll be able to try the real deal in Antwerp during Franks wedding week and tell me if you think they taste somewhat similar. There’s also a delicacy at the market we call the crazy sandwich I can’t wait for you to try! Mary, I forgot to come back and tell you, I finally made this last month and we looooved it! I will definitely be making this one again. Thanks! Thanks for giving it a go! I take little baggies and mix the spice mix up in advance so when I get a craving it’s not as much putsy work. this sounds great. does anyone know if the (2 tsp Fenugreek) would be the seeds ground up or the leaves? You can buy it in both forms. Sorry, but I have no idea. Next time I pick some up I’ll ask. I just found the remains of my last pack of Fenugreek I bought. It says seeds!